Receding gums can be a sign of a more serious dental problem, such as gum disease. A dentist or cosmetic dentist near you can provide restorative care to improve the appearance and health of receding gums. Watch this video from the American Dental Association for more information about receding gums and gingivitis. If a dentist does not treat your receding gums, you may be at risk for infection or tooth loss. If you’re worried that your receding gums are a symptom of gum disease near Hazlet , come see us at Glenwood Premier Dental. Our dentists can use advanced laser dentistry to safely and painlessly treat receding gums and halt the progression of gingivitis and gum disease. To schedule an appointment, call us today at (732) 264-4477. Dental implants are commonly used to replace missing teeth. They usually consist of three parts: a post or screw, an abutment, and a crown. The screw is attached to the patient’s jawbone. Over time, the bone will bond with the implant. A small abutment is then placed over the post to connect it to the crown, which is the visible part of the replacement tooth. If you have lost one or more teeth as the result of disease or trauma, a dentist can advise you on whether dental implants would be a good option for you. Here are a few things you should know about the procedure. First, the dentist will insert a small post or screw into your jaw. This will need to heal and fuse with the surrounding bone before the crown can be added. During the recuperation process, the dentist may recommend a diet of liquids and soft foods. The next stage of the process is known as osteointegration . The bone surrounding the implant will continue to grow and begin to bond with the inserted post. The fusion of bone and implant will help to hold the replacement tooth securely in place. The patient may need to wait until the bone has fused before the crown can be attached. This process can take several months. However, in some cases, the dentist can insert the implant and attach the crown in the course of a single appointment. Finally, the dentist will attach an artificial tooth, known as a dental crown. Dental crowns are custom made to match the color, size, and shape of each individual patient’s teeth. 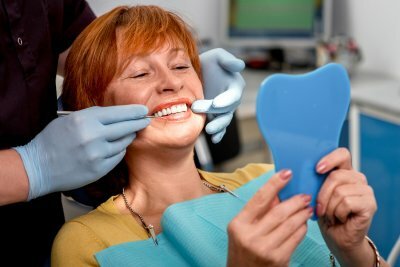 If necessary, the dentist may fit you with a temporary crown or denture, to enable you to speak and eat without obstructions, while the dental technicians complete the construction of the permanent crown. Here at Glenwood Premier Dental, we offer a range of restorative care services, including implants. To find out more about whether you would be a good candidate for implant dentistry near Hazlet , call us at (732) 264-4477, or visit our website.